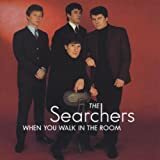 The Searchers are an English beat group, which emerged as part of the 1960s Merseybeat scene along with the Beatles, the Hollies, the Fourmost, the Merseybeats, the Swinging Blue Jeans, and Gerry and the Pacemakers. The band's hits include a remake of the Drifters' 1961 hit, "Sweets for My Sweet"; remakes of Jackie DeShannon's "Needles and Pins" and "When You Walk in the Room"; an original song written for them, "Sugar and Spice"; a cover of the Orlons' "Don't Throw Your Love Away"; and a cover of the Clovers' "Love Potion No. 9". 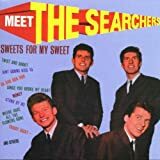 With the Swinging Blue Jeans, the Searchers tied for the second group from Liverpool, after the Beatles, to have a hit in the US when their "Needles and Pins" and the Swinging Blue Jeans' "Hippy Hippy Shake" both reached the Hot 100 on 7 March 1964.